Please refer to our stock # EMT128 when inquiring. 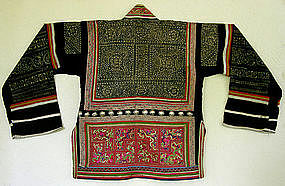 This Miao Chinese ethnic minority jacket would have been worn by a teenage girl for festival. All the batik work was hand-painted and all stitches and embroidery was done by hand. The row of silver hemisphere's across the back represent the "bubble" in the Miao creation myth.